New Jersey Senator, Robert (Bob) Menendez, who led the effort to lift the US embargo on Cyprus, was in Cyprus where he had a meeting with the President of the Republic of Cyprus, Nicos Anastasiades and the Foreign Minister, Nicos Christodoulides. As we have recorded, the lifting of the embargo is process that takes place gradually, step by step, as diplomats said, and it falls into the wider picture of the cooperation that Cyprus and the US are developing with the axis of the Eastern Mediterranean. 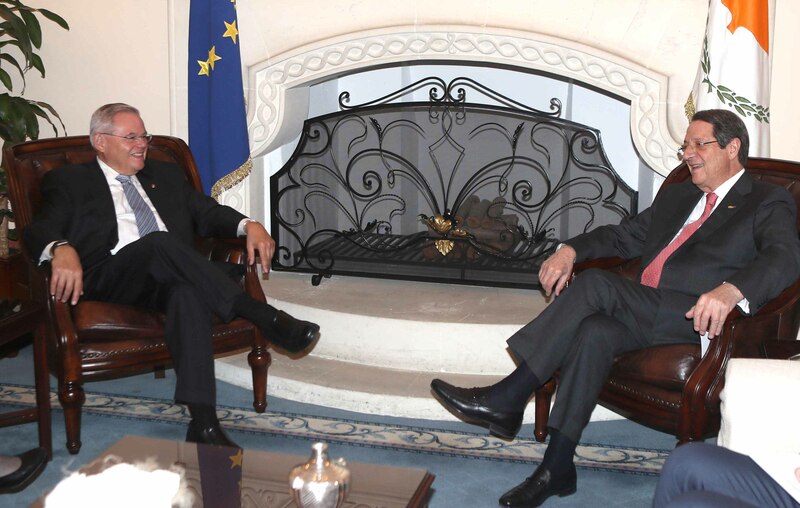 Mr Menendez himself characterized his meeting with President Anastasiades as extraordinary and he mentioned that he has a long relationship with Cyprus. On the agenda of the meeting, besides the arms embargo and the Cyprus issue, the issue of Turkey’s violations in the Eastern Mediterranean was also raised. In his statements to reporters after the meeting with Nikos Anastasiades, Mr Menendez said that the issues that were discussed were, the security strategy and the energy strategy in the Eastern Mediterranean, the continued relationship of Cyprus with the USA, the foreign policy issues in the region, financial matters, and the dynamic change in Cyprus’s banking issues. “We had a very extensive, very positive discussion and I am looking forward to continuing the deepening of the relationship between the US and Cyprus. I think this is an excellent time for Cyprus to have a new day in its relationship, not only with the US, but also with the West”, he concluded. US and Cyprus, following the declaration of intentions signed last November by Foreign Ministers, by Christodoulides and Pompeo, are aimed at the deepening of co-operation in the region of the Eastern Mediterranean. Cyprus has strong security features that, together with Greece, make it a pole of attraction for Americans from the point of view of energy relations, in addition to the geopolitical-geostrategic interest of the whole region. In this context, a cluster of partnerships has been unfolded with Greece and Cyprus on the one hand, and on the other hand with the countries of the Eastern Mediterranean, which are expressing their interest in synergies both in the energy sector and in the co-ordination of strategies on issues tackling terrorism, maritime safety, education, technology, health, etc. Diplomatic multilateralism has thus become a key strategy for the region, with US diplomacy relying heavily on it by going through theory into practice, with moves such as the signing of the declaration of intent, but also the forthcoming lifting of the arms embargo on the Republic of Cyprus.